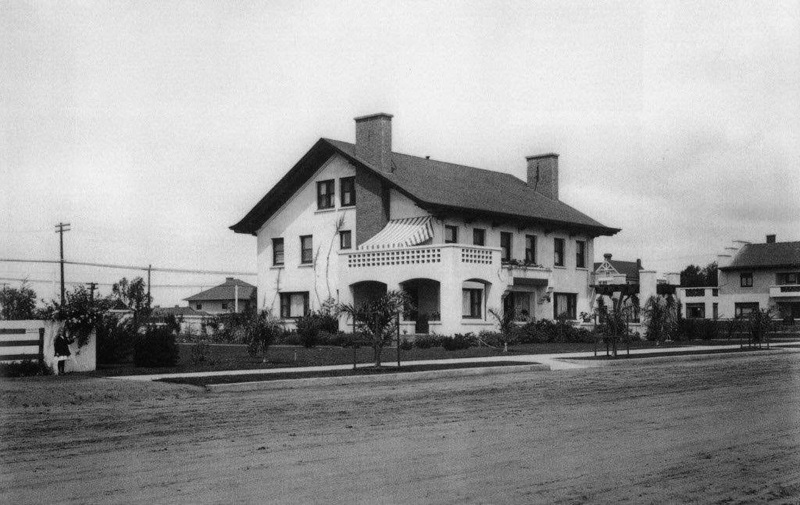 Mary Richmond compound, 204-212 Coast Blvd., La Jolla, 1911-13. Mead and Requa, architects. Just now doing a quick browse in the Historical Los Angeles Times database for what might have happened on the arts and architecture scene 100 years ago today I came upon the below fascinating article on a comparison between the two huge Expositions then well under way in San Francisco and San Diego. My current Irving Gill research and recent viewing of the wonderful "Robert Henri's California" exhibition in San Jose immediately conjured up in my mind the following stream of consciousness post. (Author's note: For much more of an in depth look at the intertwined relationships of Irving Gill, Alfonso Iannelli, Lloyd and John Wright and their father Frank, Barry Byrne, Taylor Woolley, Walter Burley Griffing and wife Marion Mahony, Harrison Albright, Homer Laughlin, Alice Klauber and others see my "Irving Gill, Homer Laughlin and the Beginnings of ModernArchitecture in Los Angeles, Part II, 1911-1916" (Gill-Laughlin)). Los Angeles Times, April 25, 1915, p. VI-1. 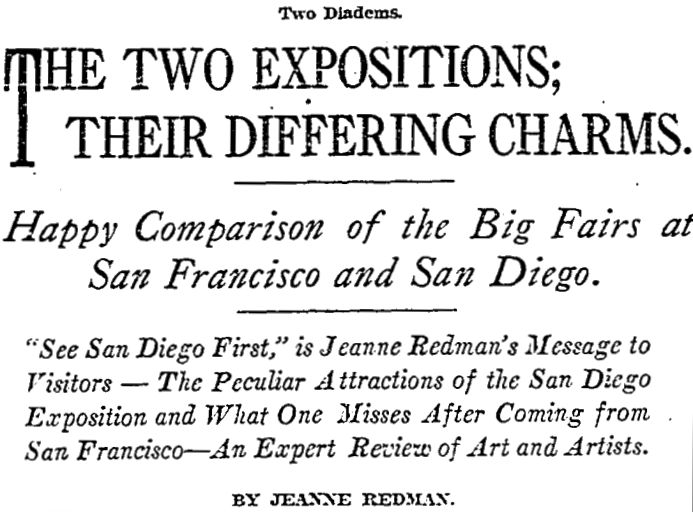 Times correspondent Jeanne Redman gave a glowing review of the Panama-California Exposition in San Diego on this day 100 years ago (see above). 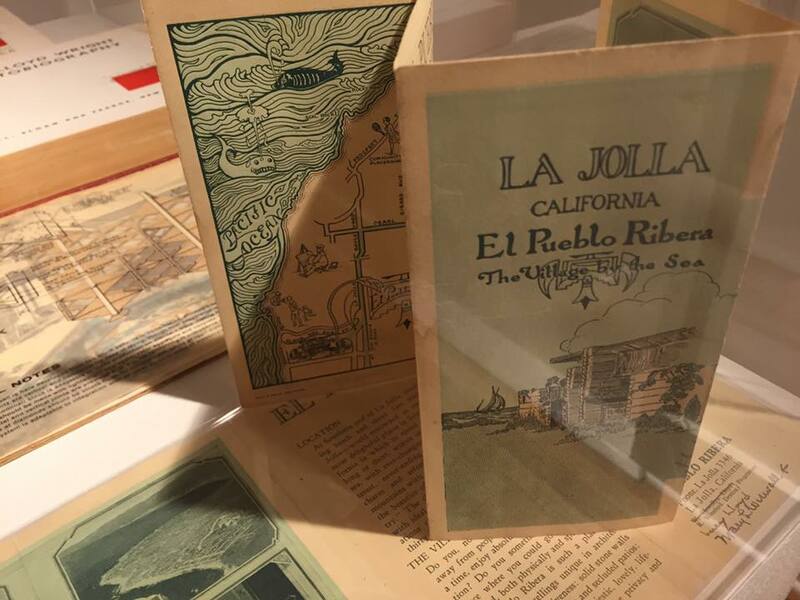 She favorably critiqued the "home town" feel of the San Diego expo and highly recommended seeing it before the more nationally and commercially focused Panama-Pacific extravaganza in San Francisco. 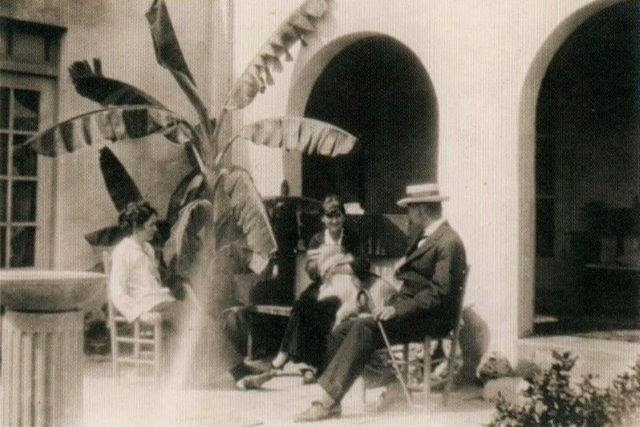 She extolled San Diego's "Spanish" Architecture of the California Building and the Palace of Fine Arts which housed an exhibition of eight modernist painters including Robert Henri whose former adoring student Alice Klauber finally lured to La Jolla during the summer of 1914. (For complete coverage of Henri's visit I recommend Robert Henri's California: Realism, Race, and Region 1914-1925, Laguna Art Museum, 2014). 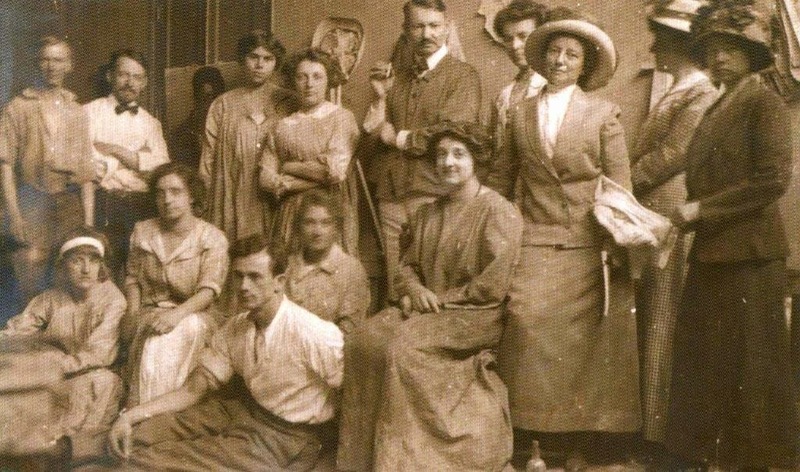 Robert Henri posing with his class in their Madrid Studio, July-August 1912. Klauber is standing third from the right. Alice Klauber Collection, San Diego Museum of Art. From Robert Henri's California, p. 17. Shortly before this article was published Frank Lloyd Wright had viewed the San Diego fair with son Lloyd and Alfonso Iannelli. Alfonso had returned to Los Angeles the previous summer from Chicago where he had been collaborating on the design for, and executing the fascinating architectonic sculptures for the Midway Gardens about the same time Henri was arriving in La Jolla for the summer. John and Lloyd Wright and Barry Byrne had befriended Iannelli sometime in 1913, first drawn to him by his intriguing modernist posters for the Orpheum Theater, their newfound Los Angeles hangout. It was John who enlisted Iannelli to come to Chicago to assist on Midway Gardens in early 1914. Fledgling architect R. M. Schindler first arrived on the scene shortly thereafter with the goal of also working for Wright. John also convinced his 1912-13 employer Harrison Albright to incorporate Iannelli's sculptures for the Workingmen's Hotel which were finally executed after his return from Chicago in mid-1914. (Alfonso Iannelli: Modern by Design, by David Jameson, Top Five Books, Oak Park, IL, 2013, p. 58 and Gill-Laughlin II). Workingmen's Hotel, San Diego, 1913-14. Harrison Albright, architect, John Lloyd Wright, designer. Image: Barry Byrne and Alfonso Iannelli at the Indiana Dunes, mid-1920s (courtesy Barry Byrne family). From PrairieMod. 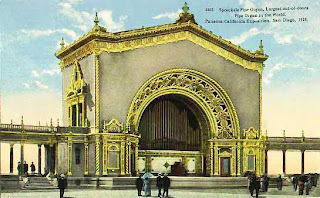 Spreckels Organ Pavilion, Balboa Park, 1914, Harrison Albright, architect. Iannelli also collaborated with Harrison Albright on the ornamental sculptural elements for the Spreckels Organ Pavilion in Balboa Park built in conjunction with the Panama-California Exposition in Balboa Park and completed in 1914. Alfonso Iannelli paint job design for Packard Motors. 1915. From ArchiTect Gallery. 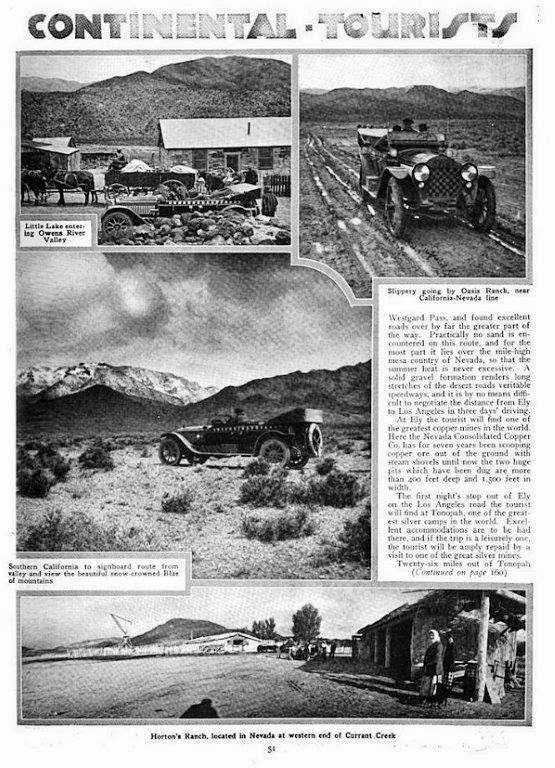 New Sights for Trans-Continental Tourists," Motor, September 1915, p. 49. 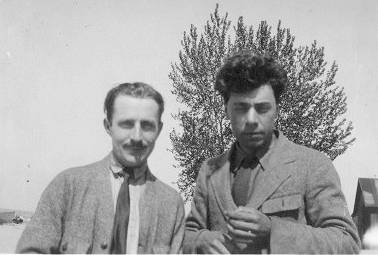 Irving and Louis Gill certainly would have also visited the fair with Wright and Iannelli or at least reconnected at some point during Wright's nearly three months winter sojourn in Southern California. Almost certainly through an introduction by Gill, Alice Klauber provided the elder Wright with a set of photographs of the Expo's Mayan exhibits which were the likely inspiration for his design of Aline Barnsdall's Hollyhock House four years later. (Frank Lloyd Wright: The Lost Years, 1910-1922 by Anthony Alofsin, University of Chicago Press, 1993, p. 225). (For much more on R. M. Schindler's fateful West Coast visit to the expositions and his gaining inspiration for his early work from the Pueblo Village exhibit at the San Diego fair see my "Edward Weston and Mabel Dodge Luhan Remember D. H. Lawrence"). Julius Wangenheim Residence, 148 W. Juniper, San Diego, 1904-5. Hebbard and Gill, architects. Courtesy UC-Santa Barbara Architecture and Design Collections, Irving Gill Collection. Irving Gill had by then developed very strong connections to Alice and her family, having designed a house for her brother-in-law Julius Wangenheim in 1904 with then partner William Hebbard and brothers Melville and Hugo in 1908. 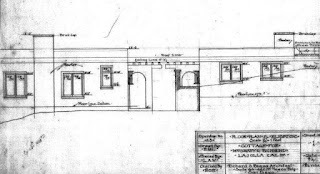 (Author's note: The Melville Klauber house was designed in collaboration with short-lived partner Frank Mead in May of 1907 but was not built until 1908 after their partnership ended. The three houses for the Klauber-Wangenheim clan are an excellent case study of the rapid progression of Gill's design aesthetic and architectural language after ending his 11-year partnership with William Hebbard in the spring of 1907 and his brief 1907-08 relationship with Frank Mead. (For more on this see my "Frank Mead: A New Type of Architecture for the Southwest"). Melville Klauber Residence, 3060 6th St., 1908. Gill and Mead, architects. Courtesy UC-Santa Barbara Architecture and Design Collections, Irving Gill Collection. 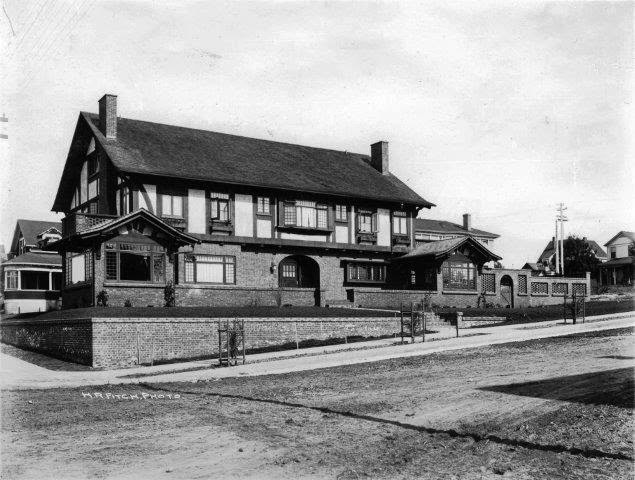 Hugo Klauber Residence, 2626 6th St., 1908. Irving Gill, architect. Courtesy UC-Santa Barbara Architecture and Design Collections, Irving Gill Collection. 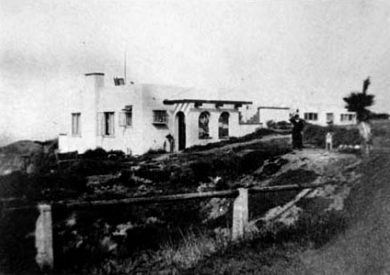 Klauber arranged for Henri and his wife to stay at Mary Richmond's compound on the bluff overlooking the Pacific Ocean in La Jolla. The structure above, designed by Richard Requa in 1911, was the first of many (including 1912 and 1919 units and 1913 additions designed by Mead and Requa) that Richmond would develop as Richmond Court to generate income as vacation rentals. 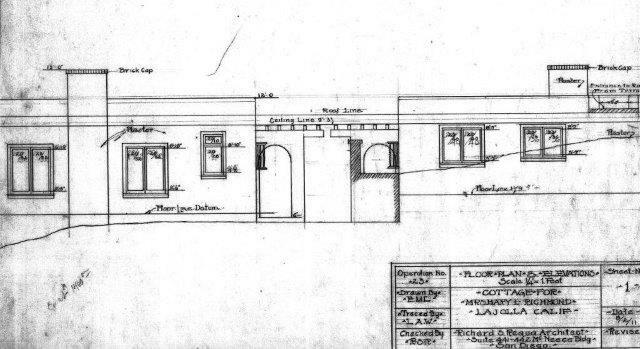 ("Building Permits: San Diego: [Mary A. Richmond] Residence," Southwest Contractor and Manufacturer, October 12, 1912, p. 38). 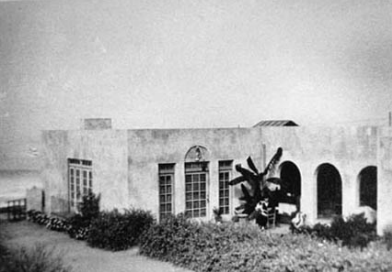 Mary Richmond Cottage, La Jolla, 1911, Richard Requa, architect. Courtesy San Diego History Center. 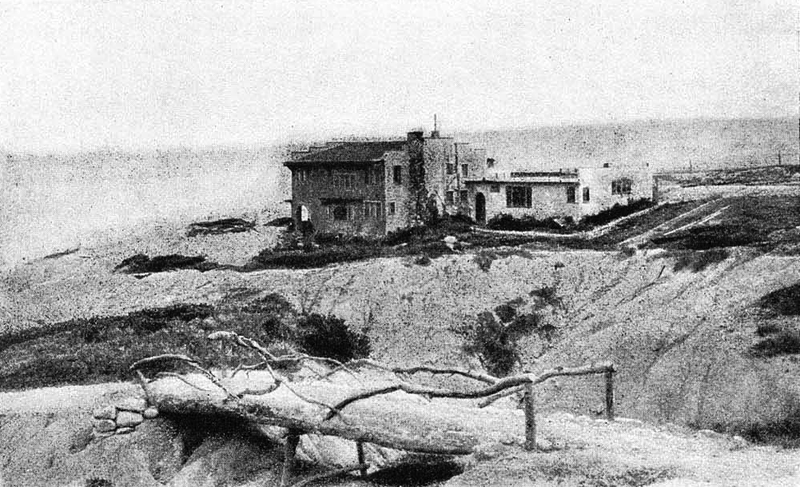 Mary Richmond compound, 204-212 Coast Blvd., La Jolla, 1911-13. From Robert Henri's California, p. 25. Courtesy San Diego Museum of Art Archives, Alice Klauber Collection. Henri with wife Marjorie and her sister Viv at the Richmond Cottage, summer of 1914. From Robert Henri's California, p. 25. Courtesy San Diego Museum of Art Archives, Alice Klauber Collection. Below is the approximate view Henri enjoyed from the Richmond Cottage during the summer of 1914. 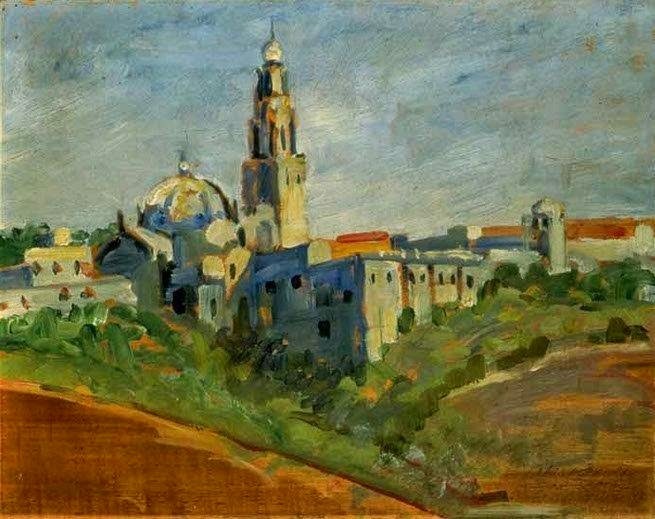 During these months the New York artist gave demonstrations to local artist groups, sent canvases to exhibitions in Los Angeles, New York, and San Francisco, and helped Klauber conceive of a complex fine art program for the Panama-California Exposition then being planned for 1915 in the city’s Balboa Park. 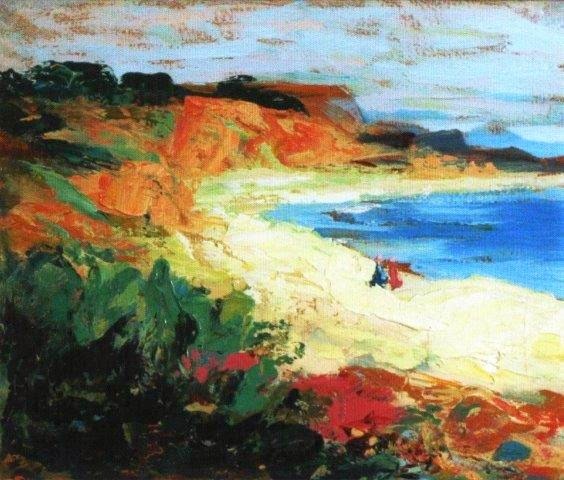 Robert Henri, "On the Beach, La Jolla," 1914. From Robert Henri's California, p. 44. Brochure for Dr. Lloyd's El Pueblo Ribera, La Jolla, R. M. Schindler, architect, Clyde Chace, builder, 1923-4. Photo by Allen Hazard, September 26, 2015 from the "Frank Lloyd Wright's Legacy in San Diego: The Taliesin Apprentices" at the La Jolla Historical Society. It is fascinating to imagine whether later Schindler client Dr. Lloyd might have stayed at the Richmond Court and been inspired to build his own compound of vacation units he would name the El Pueblo Ribera Court nearby in La Jolla (see above brochure). Schindler and Clyde Chace almost certainly consulted with Gill on their use of slip-form construction techniques for Dr. Lloyd's development which broke ground in 1923. Former Gill employee Lloyd Wright also employed slip-forming at his 1923 Oasis Hotel project in Palm Springs thus there must have been some cross-pollinating going on. About the same time Mead and Requa were working on the nearby Richmond cottage(s) a very similar looking addition was designed for the 1907 Gill & Mead Wheeler Bailey Residence (see below). (Author's note: Subsequent Frank Mead research is beginning to suggest that this addition was designed by Mead and Requa. (See my "Mead, Part II"). Wheeler Bailey Residence, Gill & Mead, architects. 1907 and addition (Mead & Reua) ca. 1912, La Jolla. 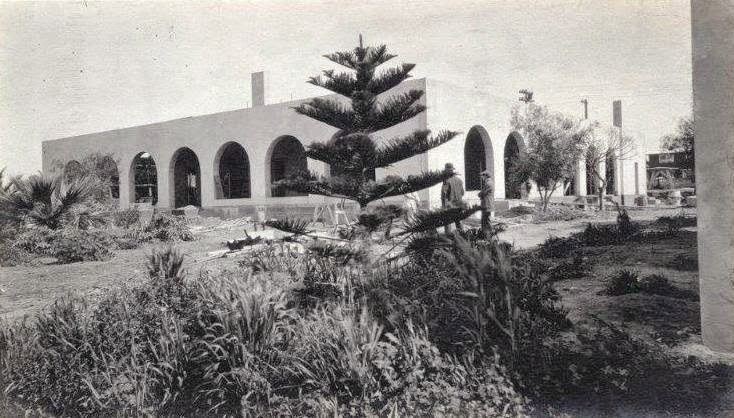 La Jolla Women's Club nearing completion, summer of 1914. Courtesy UC-Santa Barbara Architecture and Design Collections, Irving Gill Collection. 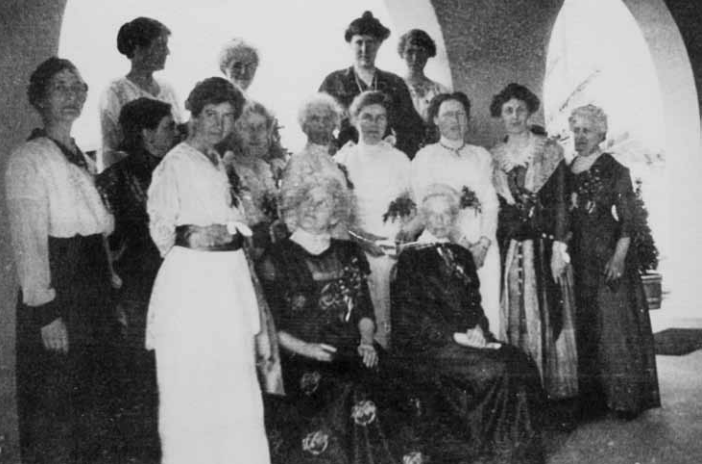 La Jolla Women's Club members, ca. 1915. Ellen Browning Scripps seated at right. Mary Richmond likely one of the others. 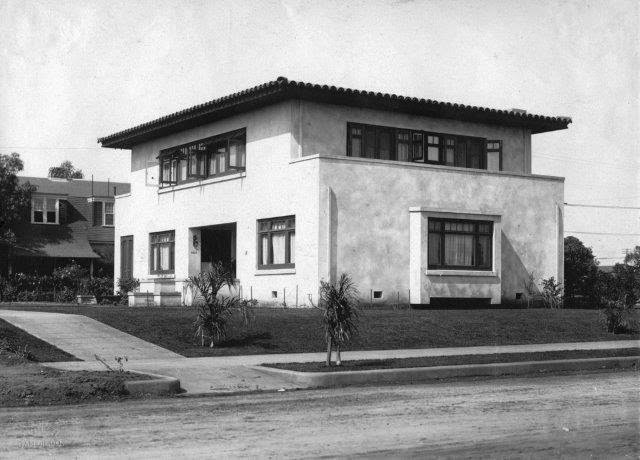 In 1915-16 Richmond served as President of the La Jolla Women's Club whose new Club House (see above) was completed by Gill before Henri's departure for a one-man show at the Los Angeles Museum of History, Science and Art in September. Richmond played the part of "The Bard" in a Shakespearean pageant presented by La Jolla Women"s Club in conjunction with the tri-centennial of Shakespeare's death in 1916. She was especially active in the Club during World War I when hospitality was extended to over 40,000 American soldiers stationed at Camp Kearney. 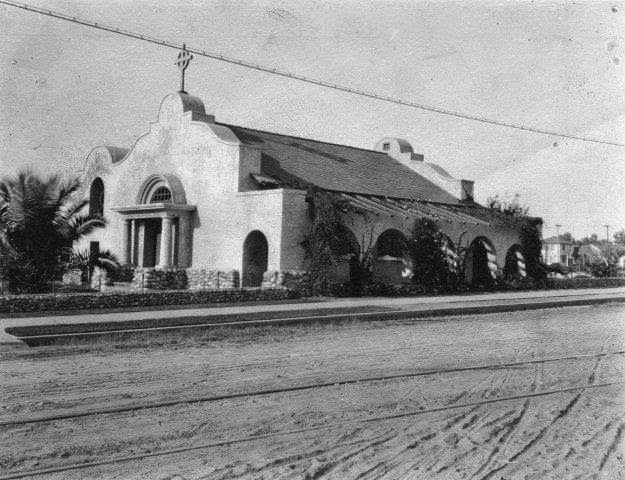 Richmond was also quite active in the Woman's Auxiliary of Gill's 1908 St. James Chapel in La Jolla (see below). St. James Chapel, 1908, Irving Gill, architect. Courtesy UC-Santa Barbara Architecture and Design Collections, Irving Gill Collection. "The twelve or thirteen character studies - or portraits - now on view at Exposition Park, were done from the people in La Jolla who were his neighbors during the two months he spent in one of the most charming houses in that dreaming village. The village slept placidly in the sun, but Robert Henri remained wide awake all the time, as the portraits prove. The sitters are Chinese, Japanese, Indian, Mexican with one solitary American - his own beautiful wife (see two below)." (Anderson, Antony, "Art and Artists: Henri's La Jolla Portraits," LAT, September 20, 1914, p. III-5. Anderson, Antony, "Art and Artists: Henri's La Jolla Portraits," LAT, September 20, 1914, p. III-5. 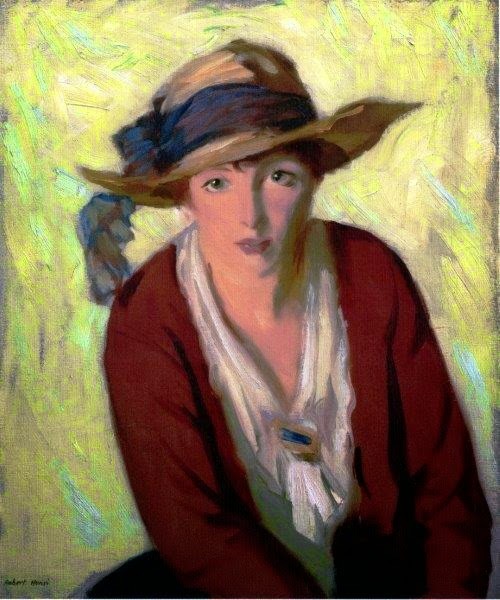 Robert Henri, "The Beach Hat," 1914. From Robert Henri's California, p. 44. The following week Anderson completed another glowing review going into detail on each of the thirteen portraits in the show. The article was illustrated with a photo of Henri's wife Marjorie wearing "The Beach Hat" (see above). It seems likely that the photo could have been provided by Louis Gill as his photos of Henri's summer production were also used to illustrate an upcoming issue of The Craftsman (see below). (Anderson, Antony, "Art and Artists: "Henri's Types," LAT, September 27, 1914, p. III-4). 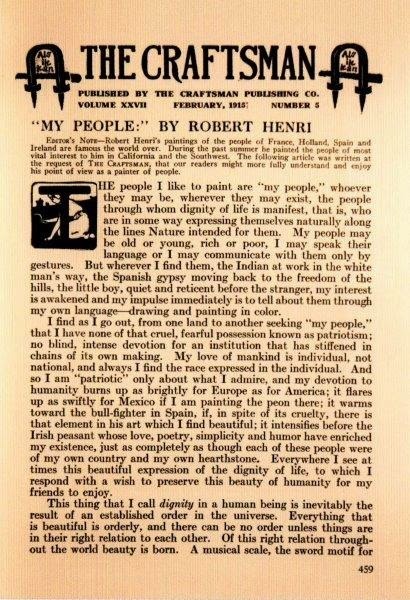 Henri, Robert, "My People," The Craftsman, February 1915, pp. 459-469. From Robert Henri's California, p. 24. The February 1915 issue of The Craftsman (see above and below) featured an article by Henri discussing his intriguing portrait subjects. Four Louis Gill photographs of Henri portraits were used to illustrate the article. 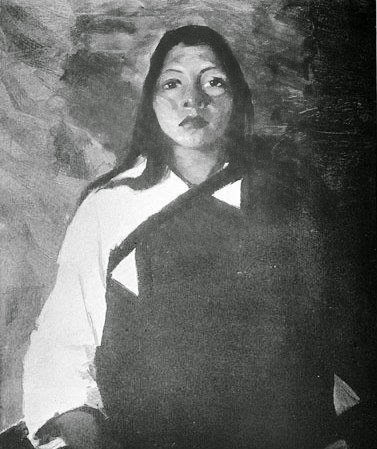 Yen Tsidi (Ground Sparrow), Robert Henri, 1914. Photograph by Louis Gill. It was most likely more than a coincidence that Gill had a three-page spread on his Timken House in the same issue. At least a dozen articles on Gill's work appeared in the magazine between 1912 and 1916 (see below). 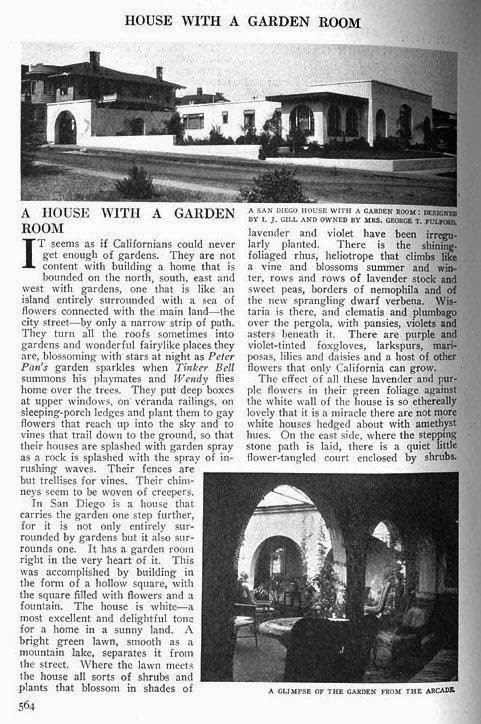 "A House with a Garden Room," The Craftsman, February 1915, pp. 564-566. 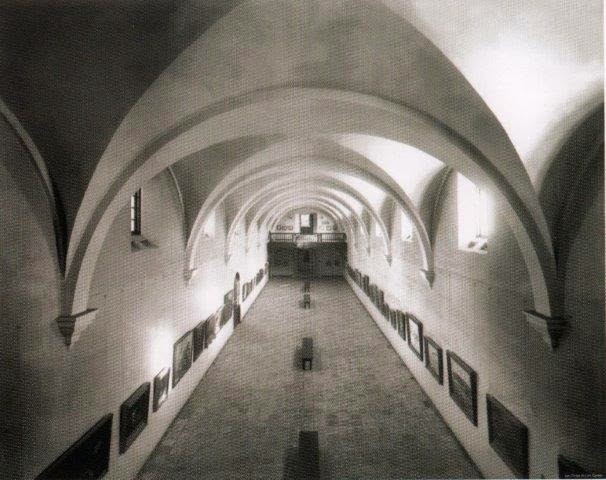 Modern American Painting Exhibition, Gallery of Fine Arts, Balboa Park, 1915. From Robert Henri's California, p. 21. Courtesy San Diego History Center. 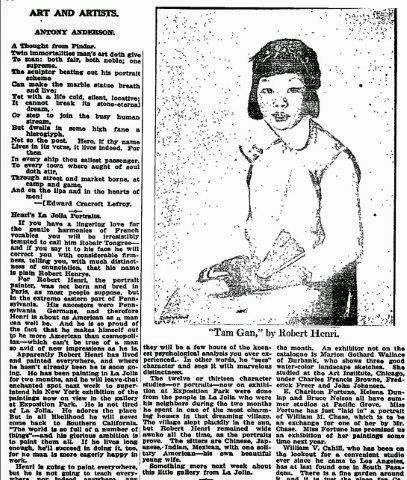 Klauber, who had been named chairman of the art department for the 1915 Panama-California Exposition and Dr. Edgar Hewett, director of exhibitions, solicited Henri's collaboration in curating an exhibition of work by some of America's foremost contemporary artists bringing us full circle back to the article I opened this article with. Among those who exhibited besides Henri were George Luks, Maurice Prendergast, William Glackens, John Sloan; Childe Hassam, and George Bellows, many of whom were Henri's stablemates in the Ashcan School. This was the first time San Diego had been exposed to a major exhibition of contemporary American art. 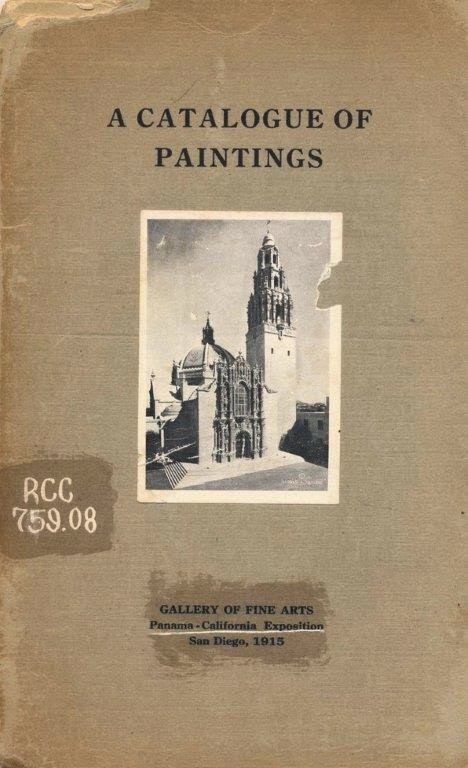 A Catalogue of Paintings, Gallery of Fine Arts, Panama-California Exposition, San Diego, 1915. Front cover. From Internet Archive. The exhibition catalog featured a brief bio and a tipped in photo of a painting for each of the eight artists. Henri selected what was most likely Louis Gill's photo of his Tom Po Qui (Water of Antelope Lake) to illustrate his work (see below). 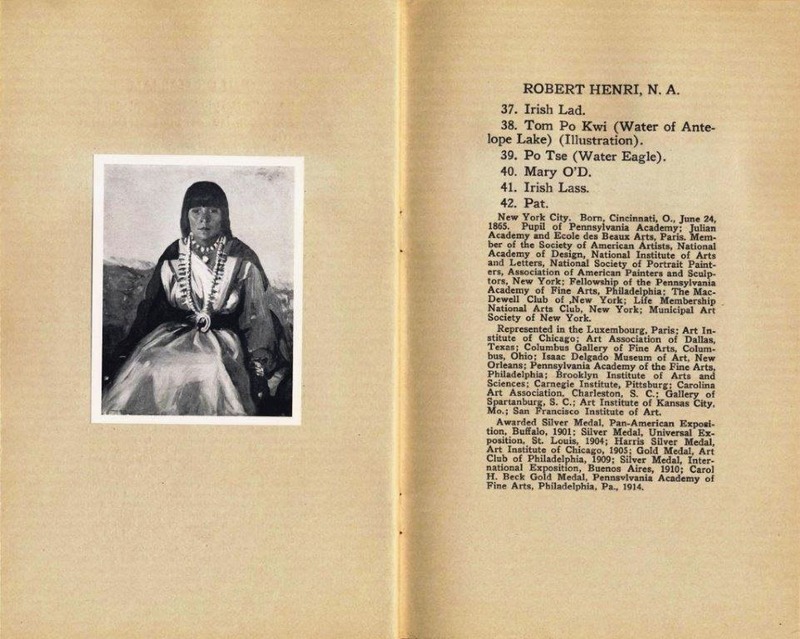 "Robert Henri, N.A.," in A Catalogue of Paintings, Gallery of Fine Arts, Panama_California Exposition, San Diego, 1915. From Internet Archive. "California Tower," Alice Klauber, 1915, oil. Site of the above exhibition. 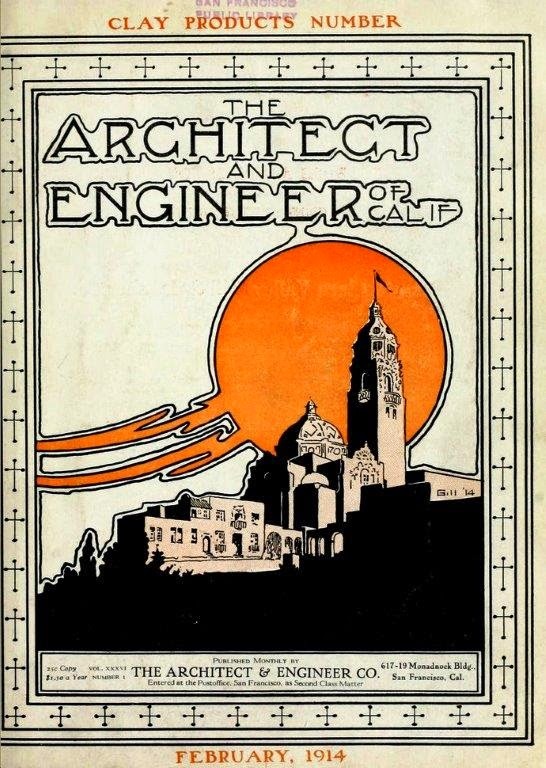 Architect and Engineer of California, February 1914. Front cover designed by Louis Gill. This article is an excerpt from a much longer piece focusing on Gill's impact on the evolution of modern architecture in Los Angeles and the serious Chicago-Los Angeles design cross-pollination going on between Gill, the Wrights, Barry Byrne, Iannelli, the Griffins, Taylor Woolley and R. M. Schindler swhich can be viewed at "Irving Gill, Homer Laughlin and the Beginnings of ModernArchitecture in Los Angeles, Part II, 1911-1916." I also found the gem of an exhibition catalog Robert Henri's California: Realism, Race, and Region 1914-1925, Laguna Art Museum, 2014, quite helpful. The exhibition is currently on view at the Laguna Art Museum until May 31, 2015. The catalog is rich in Henri, Klauber, Gill, La Jolla and Los Angeles art and architecture lore and is highly recommended. And finally my soon to be completed "Frank Mead: "A New Type of Architecture in theSouthwest" will shed much new light on these same protagonists.